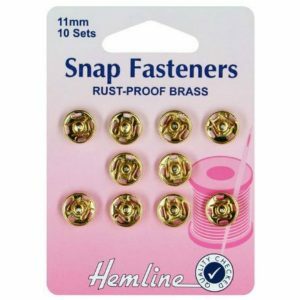 Sew-on, rustproof brass snap fasteners. Quick and easy to attach, ideal for sewing projects around the home. Central guide holes in both top and bottom assist perfect alignment when fitting. Nickel, 10 sets – 11mm, 3/8in. 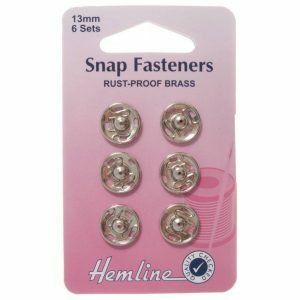 Sew On Snap Fasteners: Gold – 11mm. 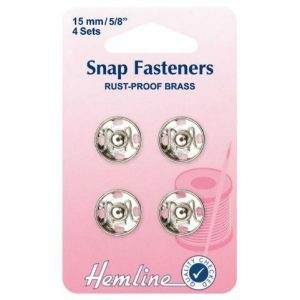 Sew-on, rustproof brass snap fasteners. Quick and easy to attach, ideal for sewing projects around the home. Central guide holes in both top and bottom assist perfect alignment when fitting. Gold, 10 sets – 11mm, 3/8in. Sew-on, rustproof brass snap fasteners. Quick and easy to attach, ideal for sewing projects around the home. Central guide holes in both top and bottom assist perfect alignment when fitting. Nickel, 6 sets – 13mm, 0.5in. 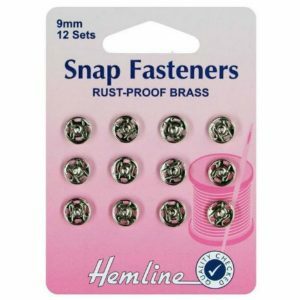 Sew On Snap Fasteners: Gold – 13mm. 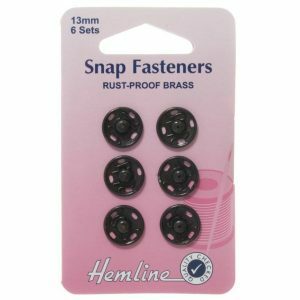 Sew-on, rustproof brass snap fasteners. Quick and easy to attach, ideal for sewing projects around the home. Central guide holes in both top and bottom assist perfect alignment when fitting. Gold, 6 sets – 13mm, 0.5in. 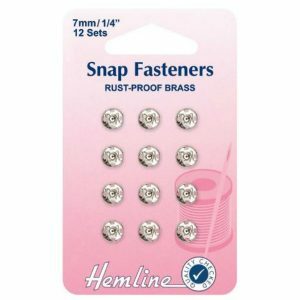 Sew-on, rustproof brass snap fasteners. Quick and easy to attach, ideal for sewing projects around the home. Central guide holes in both top and bottom assist perfect alignment when fitting. Nickel, 4 sets – 15mm, 5/8in. Sew-on, rustproof brass snap fasteners. Quick and easy to attach, ideal for sewing projects around the home. Central guide holes in both top and bottom assist perfect alignment when fitting. Nickel, 2 sets – 18mm, 11/16in. 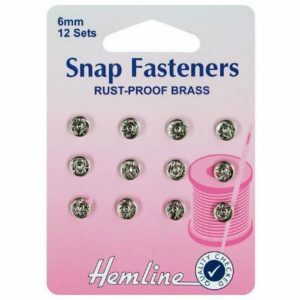 Sew-on, rustproof brass snap fasteners. Quick and easy to attach, ideal for sewing projects around the home. Central guide holes in both top and bottom assist perfect alignment when fitting. Nickel, 12 sets – 6mm, 0.25in. 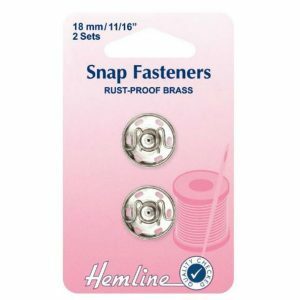 Sew-on, rustproof brass snap fasteners. Quick and easy to attach, ideal for sewing projects around the home. Central guide holes in both top and bottom assist perfect alignment when fitting. Nickel, 12 sets – 7mm, 0.25in. 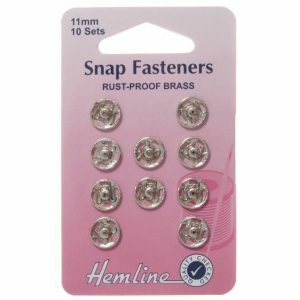 Sew-on, rustproof brass snap fasteners. Quick and easy to attach, ideal for sewing projects around the home. Central guide holes in both top and bottom assist perfect alignment when fitting. Nickel, 12 sets – 9mm, 3/8in. 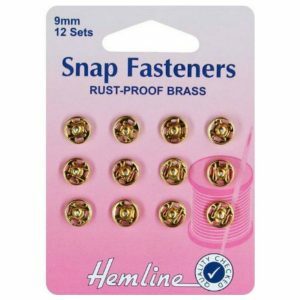 Sew On Snap Fasteners: Gold – 9mm. 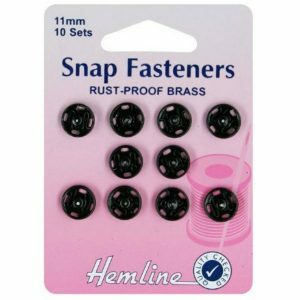 Sew-on, rustproof brass snap fasteners. Quick and easy to attach, ideal for sewing projects around the home. Central guide holes in both top and bottom assist perfect alignment when fitting. Gold, 12 sets – 9mm, 3/8in. Sew-on, rustproof brass snap fasteners. Quick and easy to attach, ideal for sewing projects around the home. Central guide holes in both top and bottom assist perfect alignment when fitting. Black, 10 sets – 11mm, 3/8in. 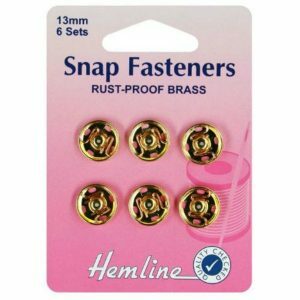 Sew-on, rustproof brass snap fasteners. Quick and easy to attach, ideal for sewing projects around the home. Central guide holes in both top and bottom assist perfect alignment when fitting. Black, 6 sets – 13mm, 0.5in.